What would summer be without flowers in the garden and birds, bees, and butterflies to flutter about them? This summer I am beyond excited to see a good number of Monarch butterflies in the garden - more than I've seen in the previous three years combined. Such a hopeful thing sign! We've also been fortunate this year to have a cooler summer with enough rain to make up for last year's bad drought. 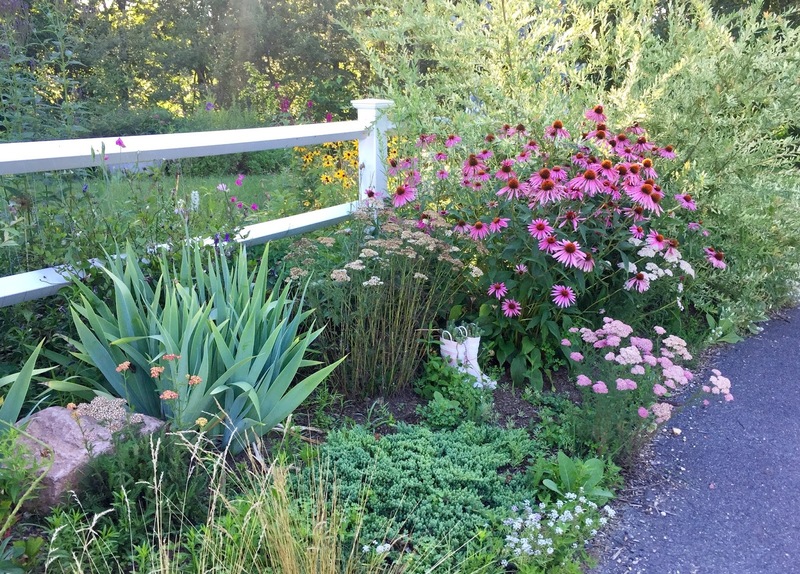 Mid-summer has brought some big storms, but other than a few downed plants, my garden is not complaining about the extra water. 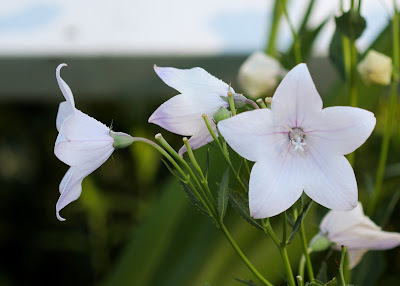 Mid-summer has also brought new blooms to the garden. I am in love with the color of these 'Shell Pink' Balloon Flowers, winter sowed a couple years ago and finally in bloom. Does anyone else grow Sweet Peas? I grew them for the first time from seed this year. They sulked after being transplanted and I thought they might die off, but they rebounded and began blooming in July. The smell is divine! It's a plant I don't seem to see often in other gardens, despite being one of those 'cottage favorites'. 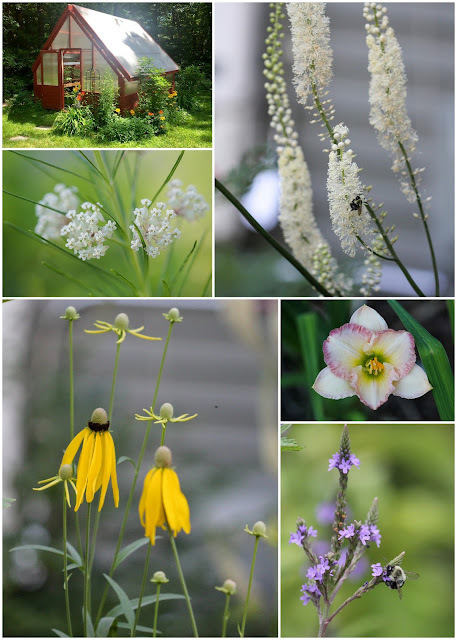 Some other plants blooming in my garden for the first time this year include Black Cohosh, Whorled Milkweed, Gray-headed Coneflower, and a pretty pass-along daylily. The vegetable garden is producing green beans and zucchini aplenty by mid-summer. The garlic has already been harvested with turnips, carrots, and bok choy sown in its place for fall. I thought I hadn't gotten many snow peas this year... until my kids informed me that they had been going out and eating them off the vines every day. 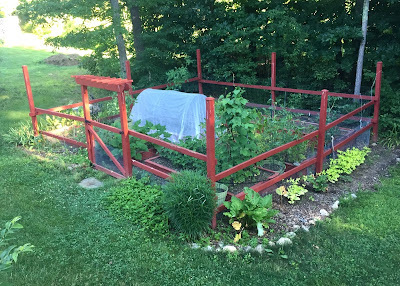 The coveted snow peas kept producing until mid-July, petering out just as the beans kicked in. I am still eagerly waiting for that first ripe tomato, though, which should any day now. While there is always work to be done in the garden this time of year (thanks to weeds, weeds, and more weeds), one must stop and just soak in its beauty once in awhile! In my opinion there's nothing like walking through the summer garden in the early morning, when the air is still cool and the birds are beginning to wake. Alas, in the early mornings I am usually stumbling to the coffee maker while mumbling incoherent things to my wide-awake children. Thankfully summer evenings are often just as lovely, if a tad warmer! I hope everyone is enjoying summer and all the beauty it brings. Just beautiful. Mid-summer isn't as pretty in North Texas. We just keep everything alive until the weather cools down n the fall. I really liked the whorled milkweed. I'll need (want) to learn more about it! That's how it was when I lived in North Carolina. It's definitely a trade-off between the hot summer where it's hard to keep the garden going vs the cold winter and short growing season we have up here! I'll have to do a post on my whorled milkweed. Its leaves are quite different, and I really like it in the garden. 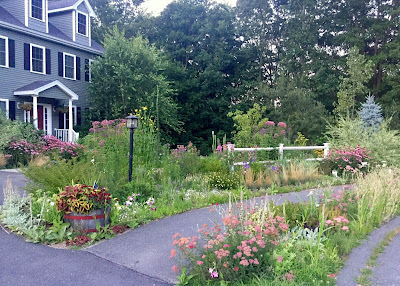 Your mid-summer garden is so beautiful and I love the hummingbird! Have a wonderful week! Thanks! That hummingbird is quite the character - it will hover outside the window every so often like it is trying to look in! Beautiful! I can see why the butterflies love your garden. Thanks, Denise! It is good to see the pollinator garden at work. Great photos! And I'm so glad to hear you are seeing lots of Monarchs.It gives me hope for the future. Me, too! I've been seeing them almost every day for the last couple weeks. Lovely photos! So beautiful to see the pollinators enjoying your garden! I agree. I love a pollinator filled garden! Oh that this magical time of year could last a little longer. Your garden is glorious and I don't remember seeing a picture of your fabulous house before. 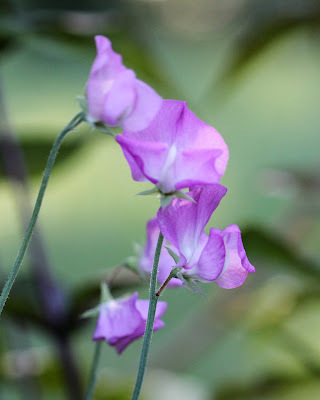 I haven't grown sweet peas for a few years, mostly because I forget to plant them. The fragrance is heavenly! I realized that I don't take as many wide shots of the garden, but rather close ups. I've been trying to do more big picture shots recently, just for my own records! 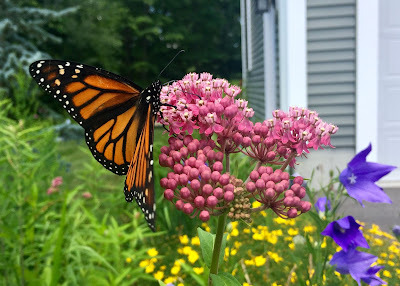 I, too, have been delighted with monarchs in my garden after an absence of many years. I'm on my 3rd generation of caterpillars - hurrah! 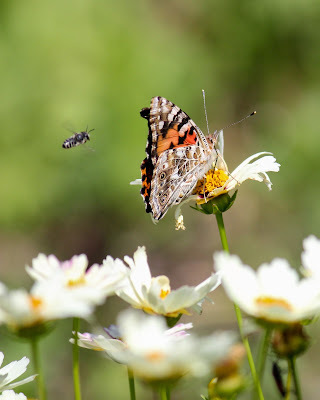 I'm passionate about pollinators and helping them any way I can. Lovely site and garden you have! Looking forward to seeing more. Good to 'meet' you, Eliza! Great to see another MA gardener who loves pollinators, too! 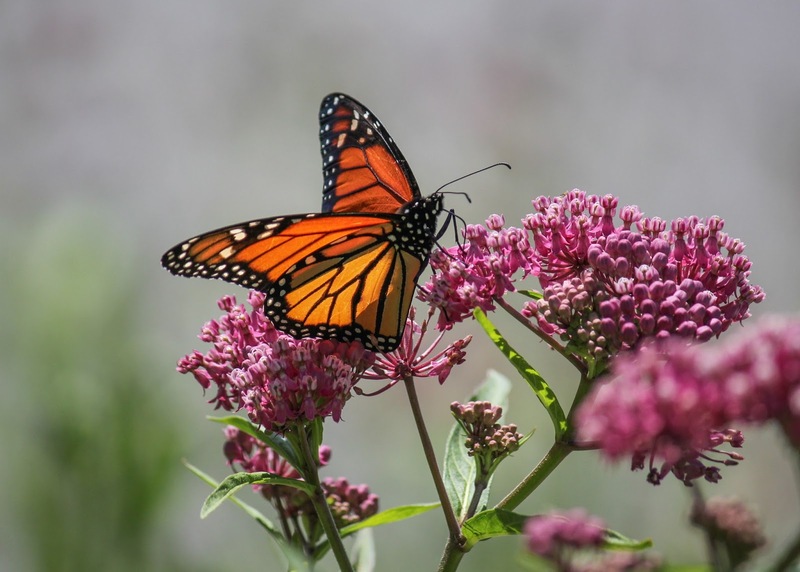 That's so wonderful that you are seeing so many more monarchs as well this year. A very hopeful sign! Your photos are very beautiful and artistic. I always watch them with great pleasure. 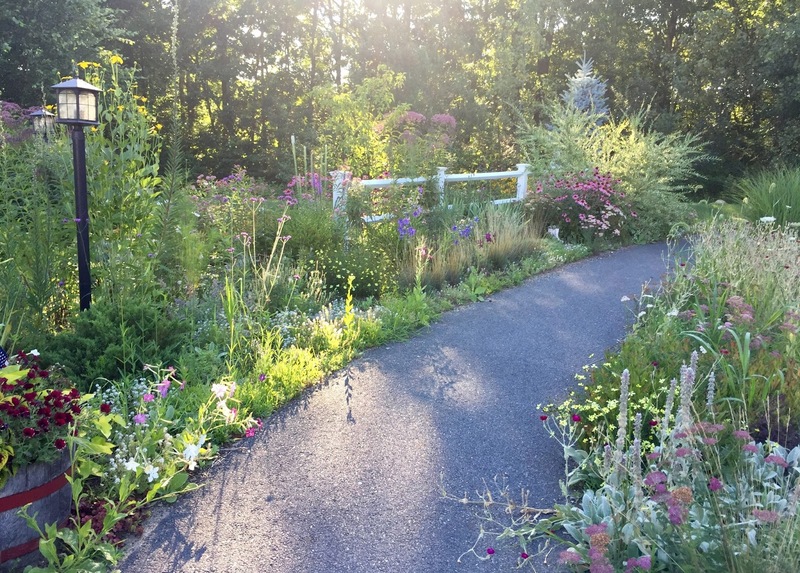 Your garden is gorgeous at any time of the year and in the summer it looks amazing. Thank you! We are getting a good amount of rain this year, which really helps all the flowers. Have a good weekend! Whorled milkweed! I must look that up to see if it grows here. My friend Cee has hatched 140 monarchs this year. Maybe some of them made it to Boston. I really like the whorled milkweed, as the leaves are so different than the others. That's a lot of monarchs! Very awesome! I took a second look at the leaves since you mentioned them and yes, they are very different. Looks gorgeous! Happy Summertime Gardening!!!! Thanks, David! Enjoy your summer! 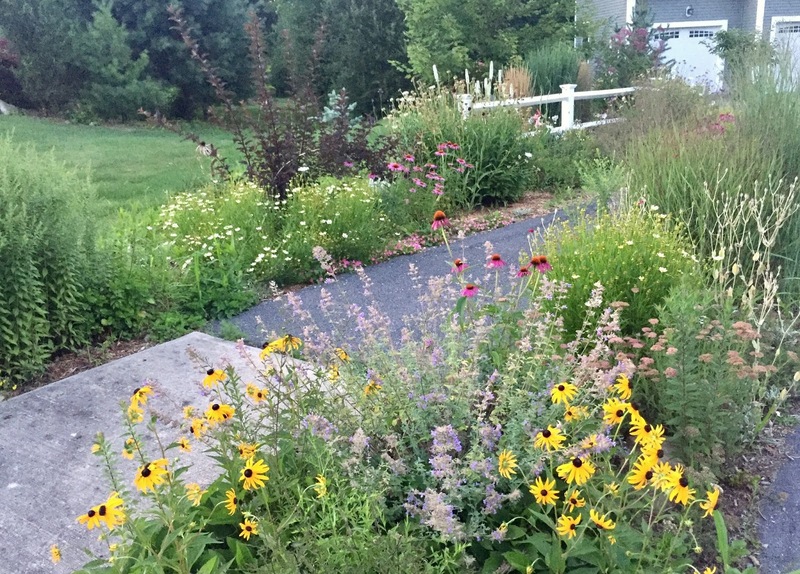 Your summer garden is beautiful! Mine here in Florida is a steaming jungle at the moment. I love your photographs, very artistic. Thank you, Evelyn! I certainly don't envy your summer (though in winter, Florida looks pretty good)! Oh my, your garden is beautiful, Indie! What a welcoming sight in front of your house, and I can see the pollinators love it. 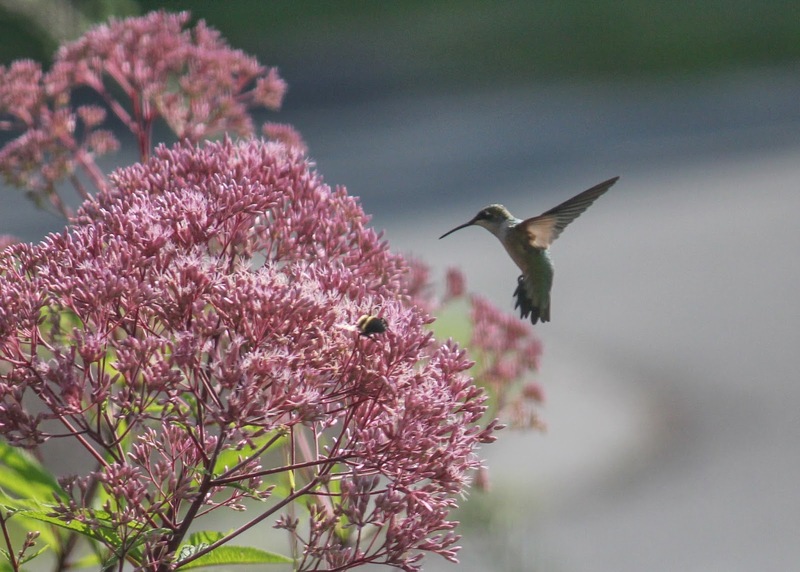 Great photos, too, especially of the hummingbird! Thank you! That little hummingbird has actually come to our windows and hovered outside of them a few times. So fun to watch! You have such a beautiful garden. I think I would spend my whole day just wandering around taking everything in. And I see the butterflies and bees are lining up to visit your flowers. Thank you! I love seeing all the pollinators in the garden. It wouldn't be the same without them! I love what you've done with the sidewalk, I bet your neighbors appreciate it.